studio smc photography | Sandra Costello: Today is my birthday! Yes, it's my birthday and while I don't like the idea of getting older I do like to celebrate! I don't have any major plans but I did want to share this photo of Bob goofing with the birthday gift he and Claire gave me this weekend. 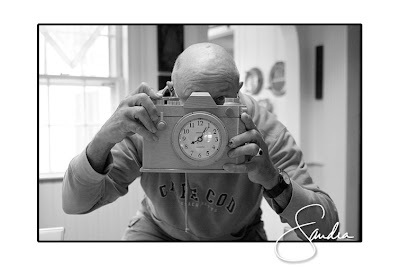 It's a handmade wooden clock in the shape of a camera. Don't you just love it!